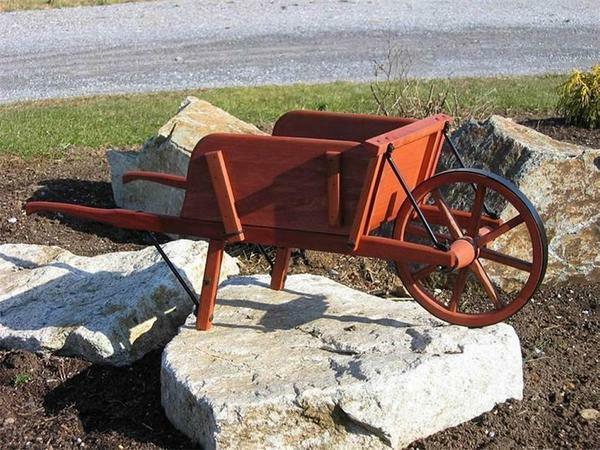 Bring the charming essence of Amish country life to your garden, patio or deck with this handcrafted rustic wheelbarrow! Fill this wheelbarrow to the brim with plants, herbs, or seasonal decorations to create the perfect look for your outdoor space. Additionally, our expert craftsmen are more than happy to hand-paint a design of your choice to the side of your wheelbarrow. We've included a list of ideas for inspiration in the menu above, but if you'd like to see your favorite pet picture, wedding or anniversary dates, favorite scripture, or special birthday or household message instead, just get in touch with us and we'll pass your information along to the wood shop. Choose from a wide variety of stains and paints to complete the look of your new Amish wheelbarrow. If you've any questions at all, please get in touch - we're waiting to hear from you. You can also visit us at our store in Sarasota, Florida near the Pinecraft Amish community.